Lise is set to star in A.C.T. 's production of Sweat. Kicking off off their season with the Pulitzer Prize winning drama that had Broadway critics and audiences on their feet. In Reading, Pennsylvania, the blue-collar heart of America's steel industry, a close group of factory workers has gathered in the local bar for generations to share laughs, hopes, and cold beers. But as recession looms and a union lock-out turns assembly line into picket line, lifelong friends find themselves pitted against each other in the struggle to survive. Inspired by the stories of Rust Belt workers, two-time Pulitzer Prize winner Lynn Nottage unites heart and humor to forge a searing drama of the grit, drive, and resilience of our conflicted American dreams. More info available here. 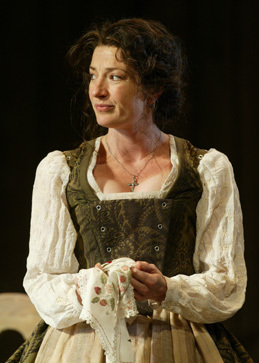 Recently Lise appeared in Roundabout Theatre's production of The Cherry Orchard in New York, directed by Simon Godwin. Regionally, she was nominated for a Helen Hayes award for her work in Brighton Beach Memoirs, as Blanche, at Theater J. She also won high accolades for her work in Arena Stage's production of Lillian Hellman's Watch on the Rhine.